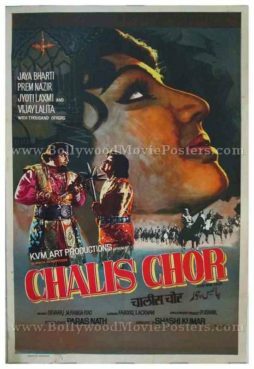 Old Bollywood movie poster of the Hindi film, Chalis Chor (1976) for sale. Printed and circulated during the first release run of the film (mid 1970s), this old hand painted Bollywood movie poster was originally designed for publicity of the film but never ended up being used. This old Bollywood poster was originally designed in hand painted oil on canvas format by a leading art studio in Madras. A printed signature of the Bollywood poster artist, AS Murty is seen on the bottom right hand corner.